(Poland circa 1986) Little is known about the origins of this robust peony, but it's a remarkable statement in the garden; a very desirable shade of deep rose pink with weeks of heavy blooming; the slightly fragrant flowers are a luscious mass of tightly curled inner petals centered on a wide fan of well-built guards; height 30 inches or more. (Roy G. Klehm 2000) A vigorous, easy to grow light pink double with some golden stamens showing through the crown; forms a tidy plant 26 to 28 inches in height; strong stems. (H. Wolfe/Hollingsworth 1998) A large light crimson (or light purple) with an anemone bomb form; the center mass of pale petals is surrounded by large dark purple guards; nestled in the pale center the carpels, which turn dark purple, provide a striking contrast; tall but strong stems from 34 to 40 inches with big, heavy flowers that will benefit from support. 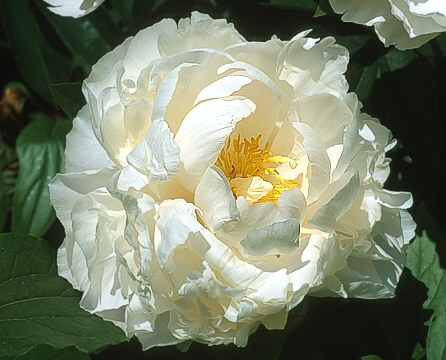 (Auten 1933) One of the most vivid and floriferous peonies in any garden; the pretty flowers, many per stem, are a contrast of pink and white with guard petals of bright cerise pink surrounding a plush tuft of white and cream; petaloids in the center have some tints of pink. 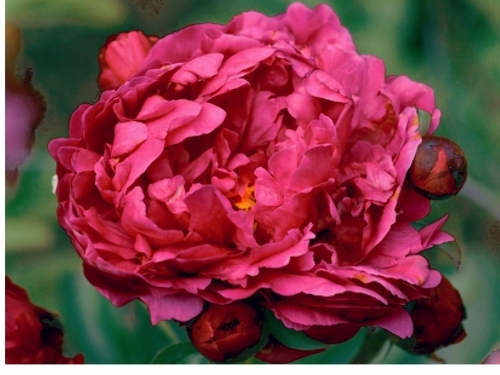 (Hoogendoorn, Holland 1949) Double blooms of fuchsine rose up to 10 to 12 inches wide with a dense mass of petals; on occasion it's semi-double; 3-1/2 ft. tall; excellent cut flower and garden specimen.